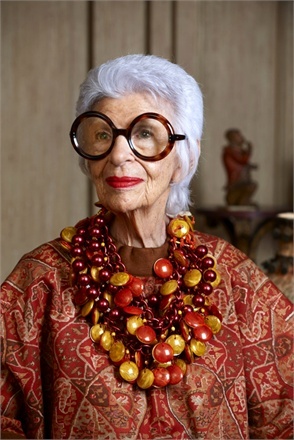 Fantasy is powerful…everybody can’t handle it in big doses, but you can try little bits at a time.”-Iris Apfel @ the Met. I’m not one to follow starlets, but as a self-proclaimed “Geriatric Starlet”, Iris Apfel has such a unique, self-aware, no-nonsense point of view, I feel like I have found a kindred spirit. Maybe it’s because she grew up an only child, like me…Plus, I admire her love for accessories paired with simple, impeccably styled, architectural clothing, and she knows how to wear some glasses. The 90 year old’s iconic black specs (that look like hula hoops on frames) inspired a generation of art world aficionados (my husband and I like to count the Apfel look a likes at art shows). I secretly covet a pair but amazingly enough, my eyes are just too big for glasses like that. Trends aren’t for everyone, and was one of her tidbits of style advice given during a fascinating panel discussion moderated by Judith Thurman at the Metropolitan Museum of Art. Apfel shared some lovely stories about personal style, inspiration, and self-confidence. “Personal style is curiosity about oneself.” (source unknown). She also discussed the importance of not being a slave to trends. “You can’t be trendy and have personal style” when you look like everyone else. This interview is a good glimpse into Apfel’s history. She’s having one hell of a year, and I think it’s great to see the fashion world embrace and respect the living history that inspires generations to come. Update 8/24/2012: So, I’ve decided it’s a good week to be a stylish 90+ year old! Check out this post/interview by Garance Dore today. The resemblance is uncanny! I wanna get old like that !! !